A little update on what’s happenin’ around here. If I was Southern I might say h’yere 🙂 It has been cool enough to work easily outside, and yet here I am on the computer…but I slip out, grab the kids, and work a bit on the yard. The grass has needed more than the usual mowing with the cool summer, I give that job to my son… anything with a machine limits the grousing. Yesterday we pruned out some trees a little. Just cleaning up their shape, no real cutbacks (I sound like a CEO here). Anyway, some lower branches an a few strong growing vertical shoots came away from the crabapples… and since the weeping willow is nearby that got a bit of a haircut,too. I had my son help me on that, too, since my hip is giving me trouble lately. Usually I do most of the light pruning, but I turned it into a lesson on how to prune properly, and told him the story of how his dad earned college money pruning trees, and he seemed to like it and have a bit of a knack for it. The trees look so much better. The willow is so big now that it was a two person job anyway… I held the branch into trimming position and told him where to cut. That tree can make things look a bit overgrown and “Addam’s Family” around here…until pruned and trimmed , and then it looks “picturesque”. I’ve also worked on getting some of the weeding done.The girls help me with that… I learned they are more thorough and with less passive-aggressive dawdling than the boys manage to always produce. Pulled out lots of poison ivy. I’m the only one for that job, since everyone else is highly allergic to it. Cut back some perennials. Especially the newer Shasta daisies, I didn’t realize they would get so large. Now they will have to be relocated: they totally overshadow some choice little campanulas that don’t like it one bit! It’s been a trying year for the crabapples with all the damp, coolness, and cloudiness. They get fungal diseases that empty the tree of all its foliage very early in the season. It’s called “Apple Scab”. Lovely name. Anyway, I had planted the Prairiefire variety specifically to avoid this problem, but this years climate conditions ganged up on it. 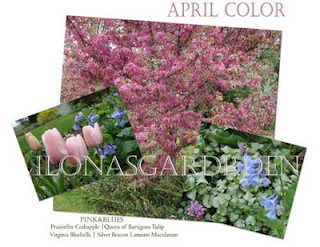 I highly recommend this tree if you like deep pink spring flowers and dusky purple leaves. When first researching I came upon this description: “Another exceptionally attractive specimen is Malus ‘Prairiefire’. The foliage is deep reddish purple in spring and matures to dark green. The tree has an upright rounded form with rich dark red flowers and small dark purple apples. At maturity, ‘Prairiefire’ will be about twenty feet tall.” I think that sums it up nicely, and it is usually on lists of disease resistant varieties. I have been satisfied that it deserves its place. It is a very tough little tree with all season interest. WSU says, and I quote: “Prairiefire crabapple is considered one of the best of the scab resistant crabapple cultivars in the nursery trade. It has purple new foliage, clear red-pink flowers, and abundant dark red fruit.” There you have it. 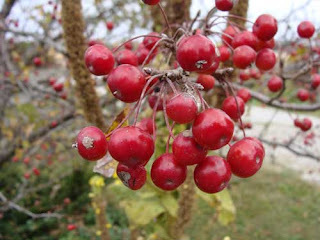 It was developed by the breeding program at the University of Illinois, and one nursery calls it the “benchmark by which all crabapples to which measured by”. I’m not sure I would go that far, but it is an excellent tree on many counts. Top among them is the spring bloom which is heavy, of beautiful rich pink, and dependable. Although one source says “best grown in loamy, medium wet, well-drained, acidic soil “, I grow ‘Prairiefire’ on an evil imported raw clay soil. is “hay-uh”. trust me, i know. dead. do the prairiefire get tall– easy enough to mow underneath? that is where evil privet often lives, so mowing close a necessity. a late cold snap) against the almost-darkness it is beautiful, in full flower also. years ago,i sent one home with mom, and it is very happy and hardy and blooms regular in her neighbor’s yard, despite ohio winters. i’ll try and find a few fallen fruit and send you some pits. tree. or perhaps a few semi bare-root? like you need another tree! %] J. Actually I do need more trees- might purchase some this fall. I’ll be traveling through GA in September sometime- maybe we can work out something. Crabapples sucker, so I might have a start for you,too. If I lived in the South (or a more southern region) I would plant ornamental cherries rather than the crabapple. Mt Fuji or Okame. I don’t know if there would be a problem planting it on ground that formerly grew the prunus genus or not. And you never know… you never know who will read your stuff eventuall 🙂 We write for posterity! cant help it, i’m a chameleon!! another Atlanta traffic-packed holiday weekend! our flowering peaches are great substitute—i have seen a deep rose one also. what do you mean no feedback? LOL! Lord, spare me from floods,whirlwinds, and Atlanta’s holiday traffic! I’ll see how I can work things during that trip and give you a heads up so you can plan, if need be. Well, maybe a crabapple would be worth a try. I kept finding a certain cultivar that gets recommended for the South, but I think Prairierfire would be worth the experiment. I just planted this crabapple in March–VERY excited to see what it does. It only gave me about three berries this firs year, but at 8′ tall I expect it’ll give me much more next spring as it settle into my evil alkaline clay soil too. I ahve hope, since yours doing well! !